Thank you for your interest in our iOS mobile apps for the iPad, iPhone and iPod Touch. 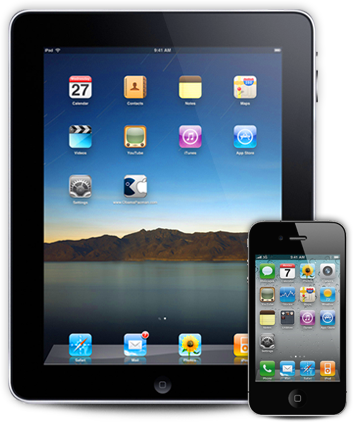 Our universal mobile apps allow you to buy the app once and run the same app on the iPad, iPhone and iPod Touch. Our Universal apps run on both the iPhone and the iPad. You purchase the app once and can run anywhere. You can re-download the app again and again without having to the need to purchase. 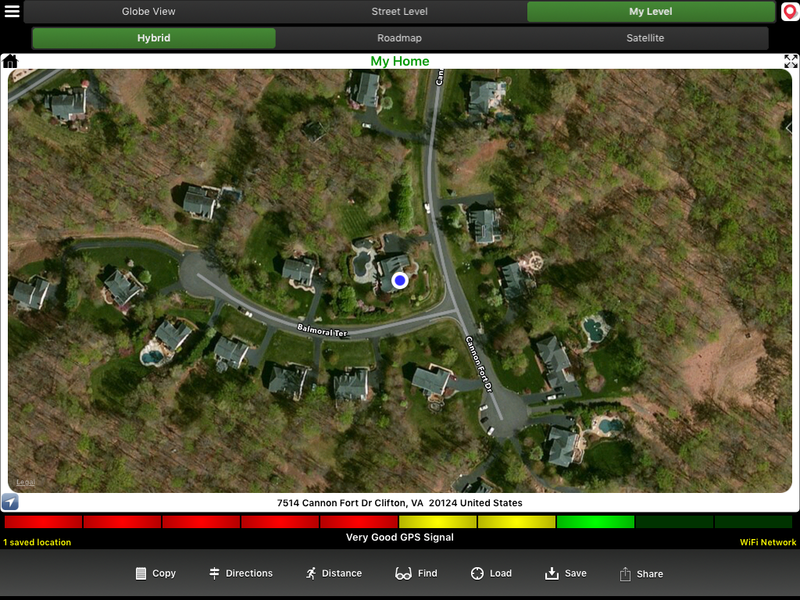 using your iOS device's mobile GPS." Easy text to speech processing with auto language translation -- great for traveling or learning a language. Reads text in natural sounding voices for over 90 languages. You can even share an MP3 audio file of the read text with anyone using Facebook, Twitter and other services. Translate, Say and Share. "Perfect App! - I love this app! 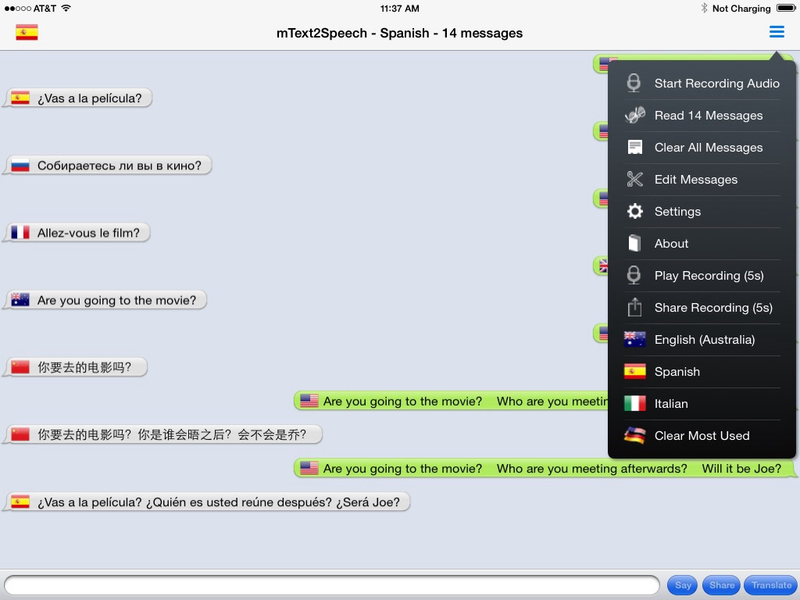 It translates your text phrases into many different languages & back to English! As a nurse, I often have non-English speaking patients (& not just Spanish, but others too) & communicating is often difficult because my Spanish is poor! This app allows me to interview the patient because the app can say the phrase & types it in the alternate language. I can have the patient use my phone to type back their questions & answers for translation back to English!" "I use this to translate words from English to French most of the time and it works well. It's a great app, it doesn't drain battery and offers a lot of languages." "This is a nicely designed app. It has a simple interface, but that is perfect as it lets you do exactly what you want without cluttering the screen with option. With that there there are TONs of options for doing translations, audio and textual. They are accessed with a simple tap." Accurately measures walking, running or driving distance, using your mobile GPS. Click Start Measuring then start walking or driving. 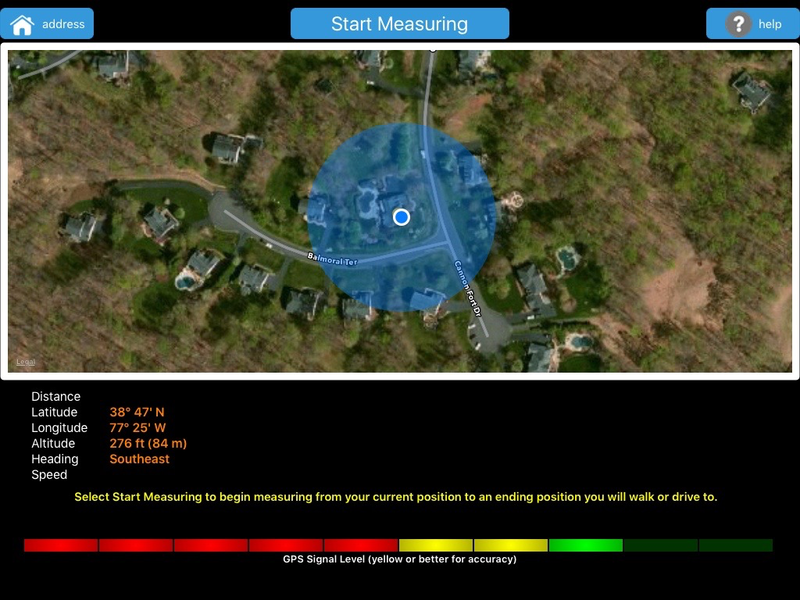 Once you get to your destination, click Stop Measuring. Distance is shown in feet, meters and miles. Now indicates Max Speed and keeps track of measuring history. Also indicated is the current latitude, longitude, altitude and direction. Easily transfer photos and videos between iPad, iPhone and iPod Touch devices using Bluetooth with or without any network support. Additionally, can share photos and videos using services such as Facebook, Twitter and Email. 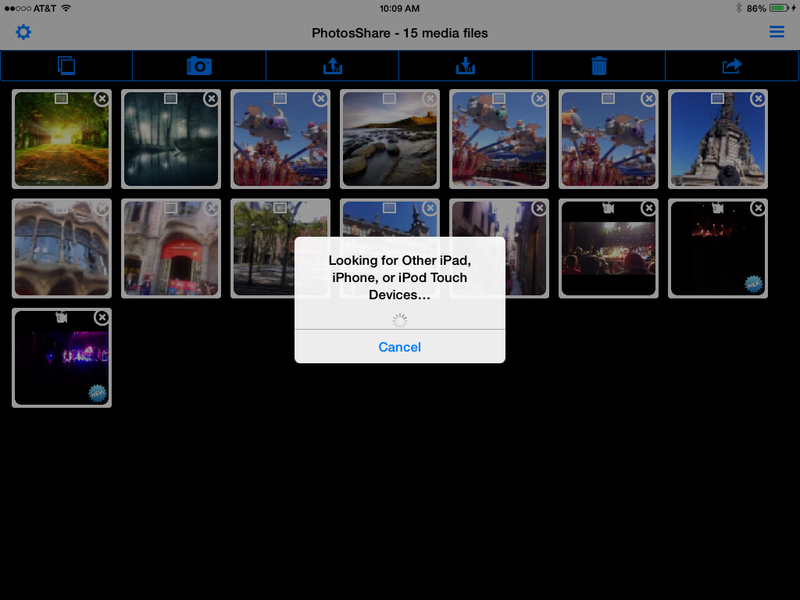 Simply select or take photos or videos of the pictures to send then send to another iOS device. Can now select from photos and videos, photos only and videos only. Also marks new photos and videos. Now uses iOS PhotoKit for high performance & smart caching. New User Interface for selecting photos & videos. The other device must be running PhotosShare and be in receive mode. Also share to popular services such as Facebook, Twittter, Email and more. Your system information at a glance. Over 60 pieces of information covering the areas: System, Memory, Network, Location, Media, folder and Process information. Any area's information can be copied to the clipboard for your own use. You also can copy or share all of your System information. NEW Network Ping for Network Information, New Photos and New Videos details for Media Information and SIM details for Device information. Find places nearby for food, drinks, coffee, shops, arts, outdoors, sights, speciaql deals and top picks. 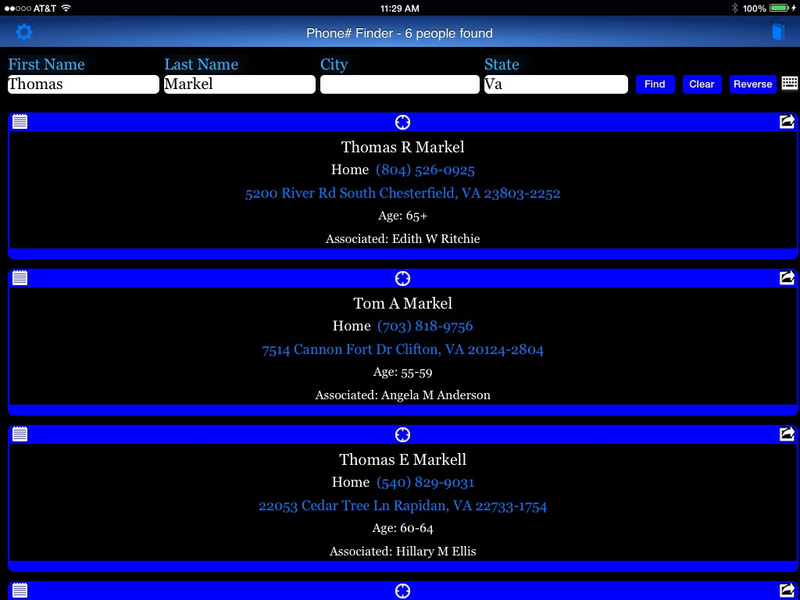 Phone# Find finds a persons phone number using any portion of their name or address. Click on the found phone number to make call that person. Click on their address to view a map of their location. Share results to Facebook, Twitter and other services. Find any address using any portion of an address. The address matches found displayed include the address, area code, airport code and latitude/longitude. To find all cities named Milford in the USA enter 'Milford USA'. Any resulting address can be copied to the clipboard so that you can use the address. Any resulting address can be shared via Email, Twitter, Facebook and much more. Finally, a beautiful fun new way to explore your photo library on your iPad, iPhone and iPod Touch. Photos are organized by the date you created them or by their album name for quick photo discovery. Need to adjust a photo quickly such as rotate, filter or a special effect? (See Photo Gallery Editor toolbox. Now uses iOS PhotoKit for high performance & smart caching. Use the toolbox of tools Enhance, Effects, Frames, Stickers, Focus, Orientation, Crop, Adjust, Sharpness, Splash, Draw, Text, Redeye, Whiten, Blemish and Meme. Share easily using Twitter, Facebook, Tumblr, Flickr and many more services. New Quick Menu for access to popular functions. CoffeeFind locates the coffee shop near you or any location in the world. Just launch the app and see your nearest coffee shop or search for specific address. Now spports all types of Coffee Shops: chains such as Starbucks, Duncan Donuts and McDonals as well as all your local coffee shops. 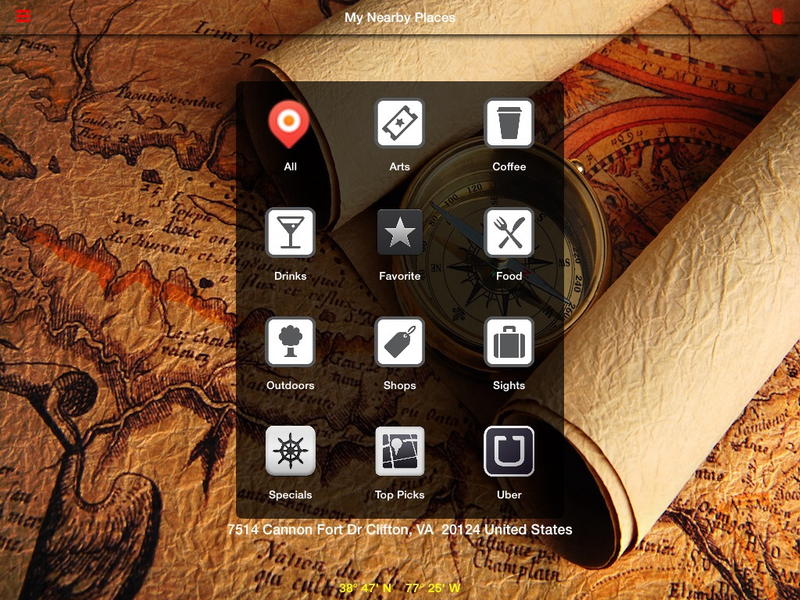 • Coffee shops nearby are shown on a map with pins. • On map can move to new location search from there. • Shows coffee shop name, address, current status (open or closed) and phone number. • On the iPhone, selecting the phone number will make a call to the coffee shop. 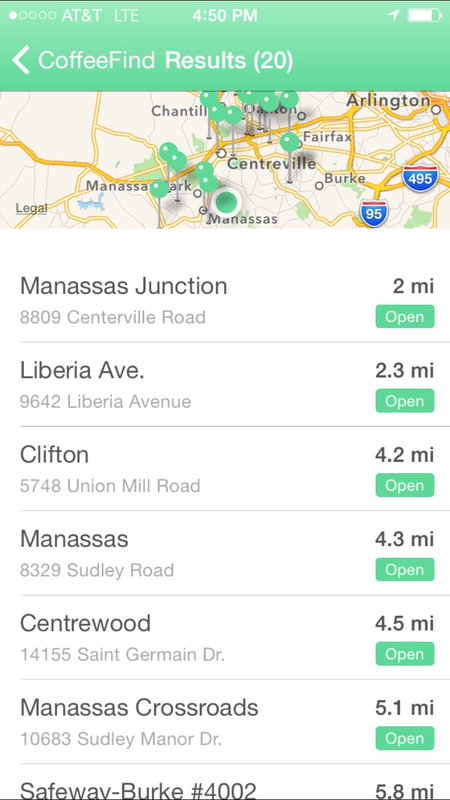 • Open coffee shop location on Apple Maps, Google Maps, Bing Maps or Waze and get directions. Use Share icon to get directions or share. Quickly find places near you for Arts, Coffee, Drinks, Food, Outdoors, Shops and Sights. Find Special Deals and Top Picks for your area. Create a Favorites query to do a custom search for key places you like e.g. Deli, Panera, Shopping Malls, Mexican. Get directions to the nearby place or find an Uber car. Uses Foursquare to find specific types of places. iSpeedAlert let's you monitor your speed and sound an audible voice or sound alert when a desired speed is exceeded. Use to audibly alert yourself that you exceeded a speed limit. Support mph (miles per hour) and kph (kilometers per hour). This designed for cars but can be used when running or walking also. Alarm speed minimum is 3 mph or 4.8 kph. On an iPhone only, if the app is switched to landscape mode, the map is hidden. Turn back to portrait to show the map again. 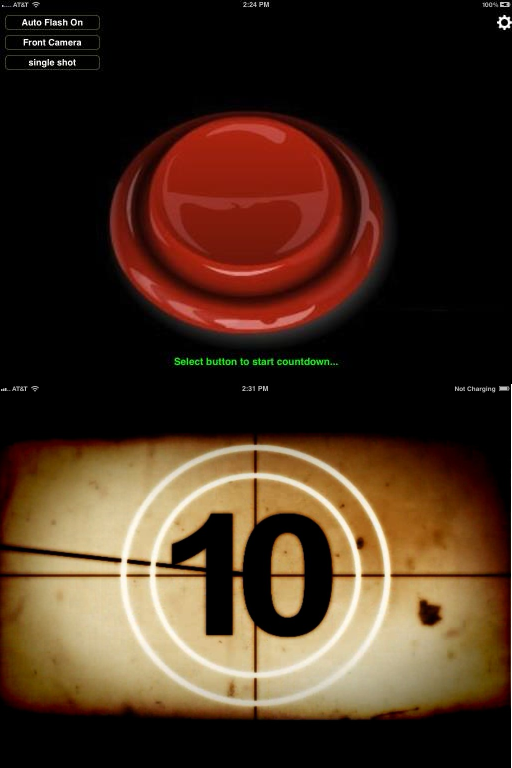 When the Alert is on, the speedometer will have a red border. 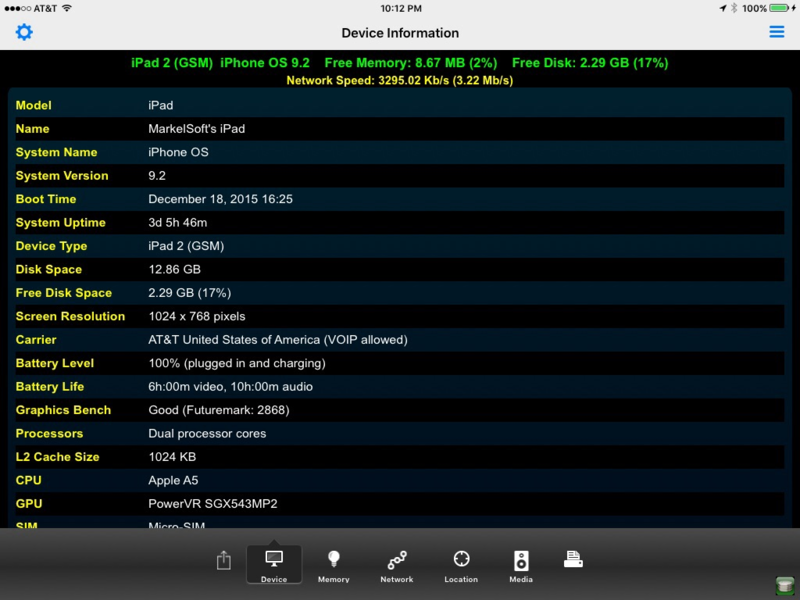 Mph and Kph are available in the settings. Alert voice and sound are available in the settings. Speed Limit and Manual Alerts are now supported. The current speed is always shown and monitored. 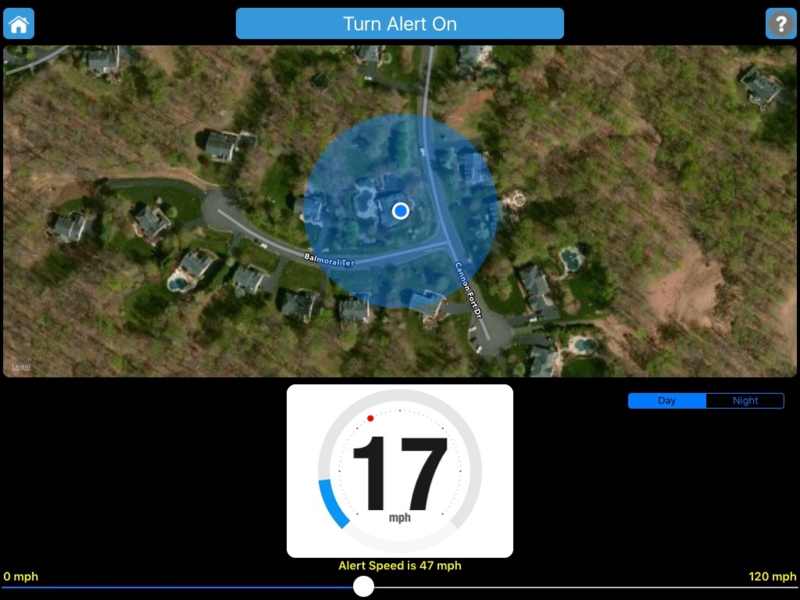 To turn an speed alert on, use the slider to select the desired alert speed then click Turn Alert On. 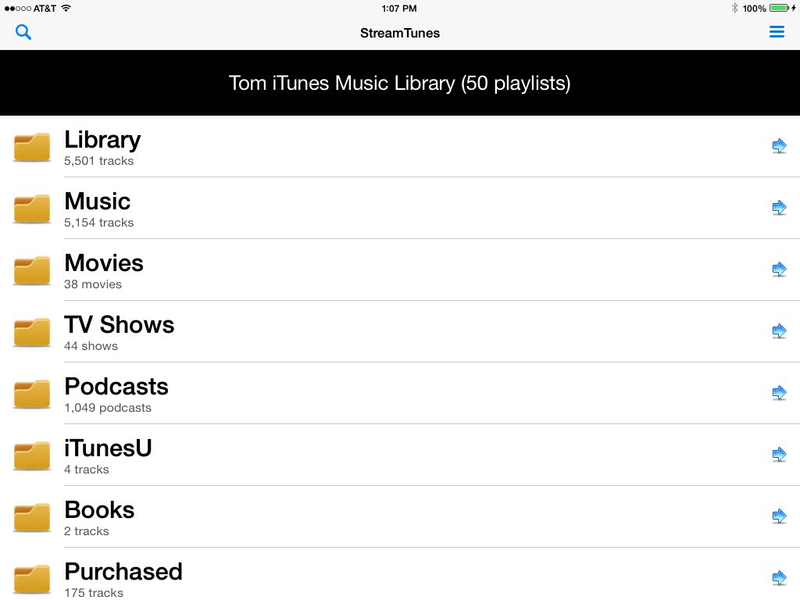 Stream your iTunes Music Library music, video, audiobooks, podcasts, TV shows, pictures and documents to an iOS iPad, iPhone or iPod Touch device or any browser. Stream video,music, photos and documents. Anything that is in your iTunes Music Library. SnapVideo is the best way to see and share life in motion. Create beautiful videos of any length in a simple and fun way for your friends and family to see. Stop-start, tap-and-hold Vine-like video recording with any number of recordings. Tap-and-hold to start recording and release when want to stop recording. Repeat to append additional video and finish when done recording. Play, save or share the created video. Share using a text message, Email or Facebook. Save video to your Camera Roll. Share with other apps that process video. 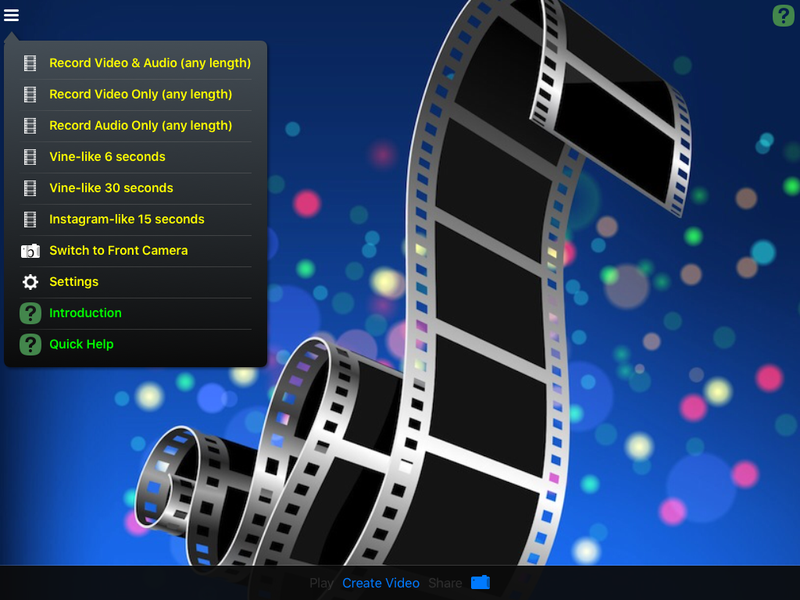 If desired, you can automatically start creating the video when the app is opened. 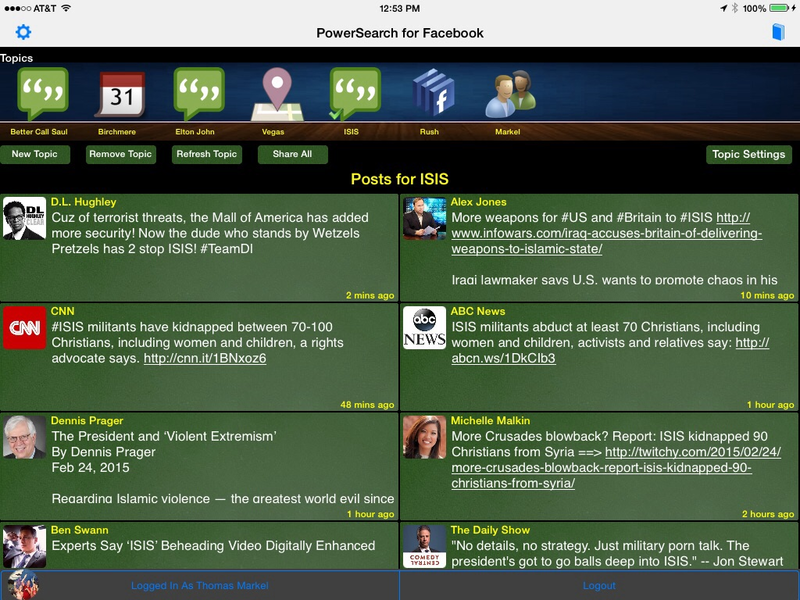 Universal mobile app for iPad, iPhone & iPod Touch. Buy once and use on all your devices. Shows you all the videos you have uploaded to Facebook. Video details include Video Sizes, publisher name, created date and time and updated date and time. You can also easily record a video which is automatically saved the Photos. When completing a recording, you are asked if you would like to upload the video to Facebook. Download you Facebook videos to your camera roll or SD card and watch later offline. Also new videos for the last week are marked with a new icon. Collage allows you to make a Collage of all your friends profile pictures. Simply login to Facebook then click 'Make Collage' to create a collage image and save to your Photos area. If you want larger or smaller pictures, go into Settings (upper-left hand corner). 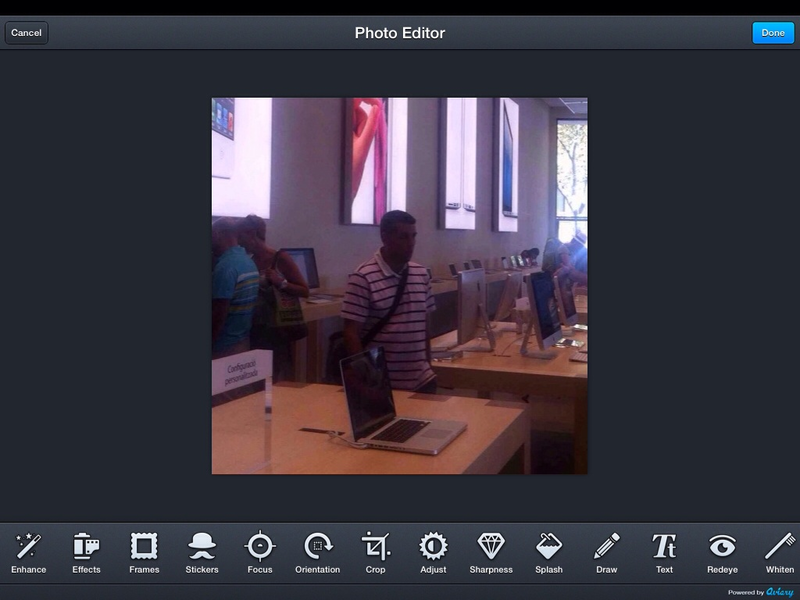 New photo editor for adding borders, frames, stickers, text and much more to the collage. The collage title and sub title area is customizable. 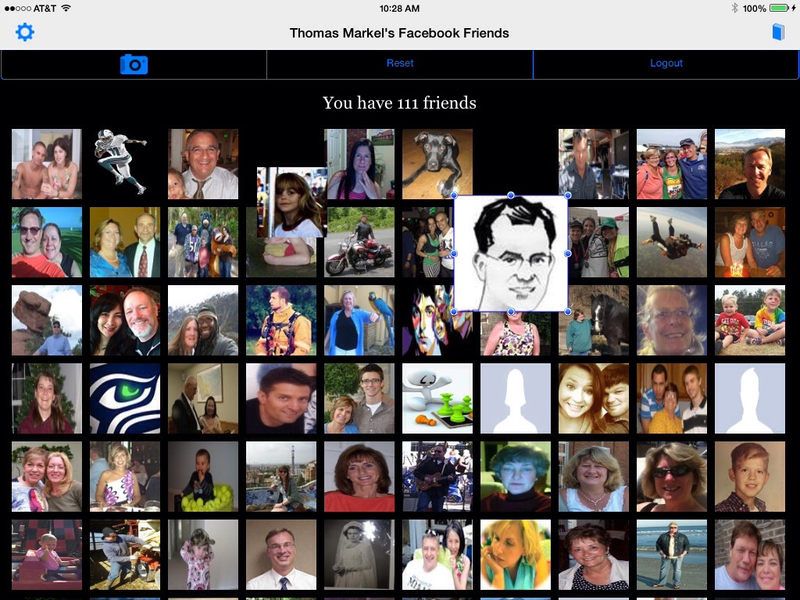 If you want to make a very personalized friend snapshot for you, a family member or friend, you can do so. So if you want to see text other than 'You have 3 friends', click on the field and change before your make a collage. Each day see newly discovered information that you are interested in. Specific posts (e.g. posts about Elton John), upcoming Van Halen or Justin Bieber concerts, places around the world, shown with maps, such as all towns named Cooperstown and more. For upcoming events, such as Van Halen concerts, the time until the event is show. e.g. 3 days to go or 4 months to go. 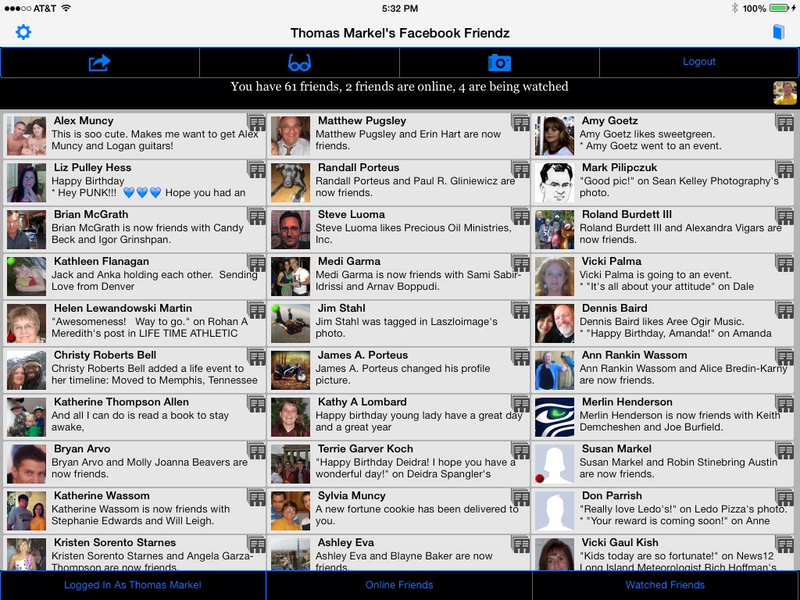 Friends for Facebook shows a live view of all of your Facebook friends along with their online and wall status. Your friends can also be shown with picture-only which is useful for the iPhone or iPod Touch or when you have many friends. 1-click post to any friends wall. Now can read Wall Posts in a computer voice. Clicking the picture will display a popup menu allowing you to post a message to that friend's Facebook Wall, go to the user's Facebook page or watch when the friend comes online or offline. Friends that are online have a green dot in the upper left-hand corner of their picture. The People icon in the upper right-hand corner displays the full status details. The full status details shows the most recent post first followed by older posts which start with an *. Details areonly displayed if not in Picture Only mode. Tour all the countries of the world using live webcam pictures throughout the world. Share, map, save or go to webcam website, if any. Use 'roll the dice' to randomly select a country to tour. You can also roll the dice on startup so you will always see a random country tour when starting the app. Webcams.travel is the largest and fastest growing webcam community on the web. With WebCams World Tour Machine, you can be part of it. Display Webcams nearby your current location, a specific country, a specific address as well as the most popular webcams in the world. Save any webcam as one of your favorites. Play a slideshow of live webcam images for your current location, a specific country, popular webcams or your favorite webcams. Webcams.travel is the largest and fastest growing webcam community on the web. With CamsNearby, you can be part of it. 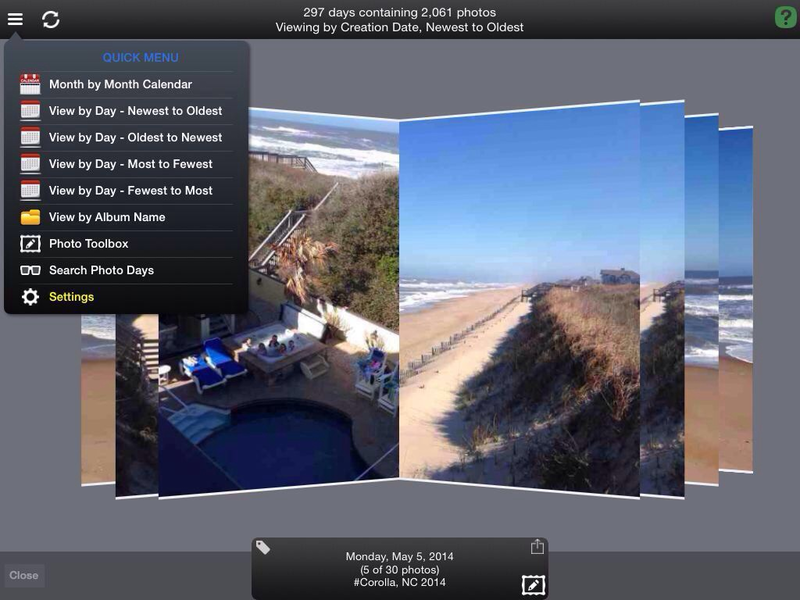 TimerCam provides a 10 second audio and video timer for taking unattended pictures. Perfect for your iPad or putting your iPhone or iPod Touch on a tripod and taking unattended pictures of you, your family or friends. Easily take single or multiple pictures. Take a single shot unattended timed picture or multiple shots of 1, 2, 5, 12, 24 or 36 shots. Taken shots are automatically saved to your photos so you can look at them later. Use the rear or front camera as well as a flash. 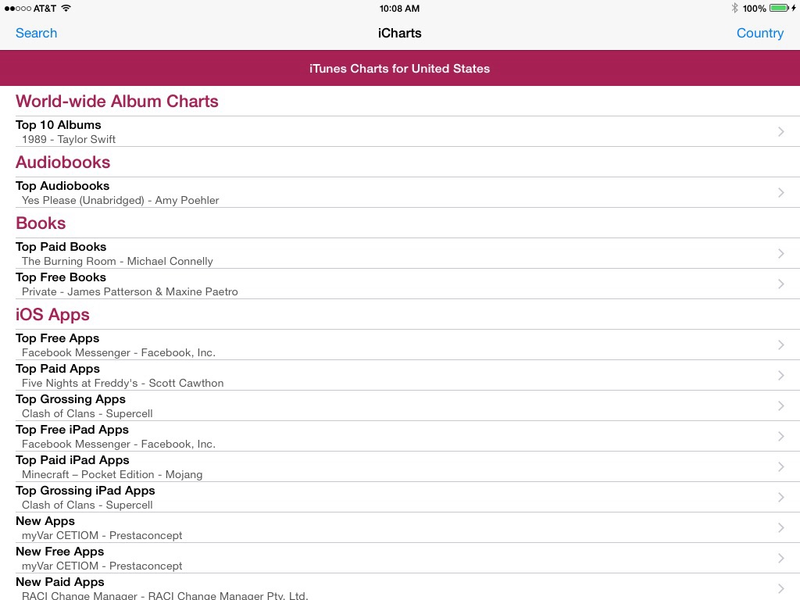 Display the top 100 of each of the iTunes charts allowing easy access to what is popular. Inital summary page shows the top entry for each chart. Much simpler than the iTunes store as iCharts is one click access and then click an entry to go to the associated iTunes Store entry. NEW can switch to charts for a specific country. By default displays you default country locale. Display your live current address. Copy the address to the clipboard for your own use. Reliabiity indicator for determining GPS strength. 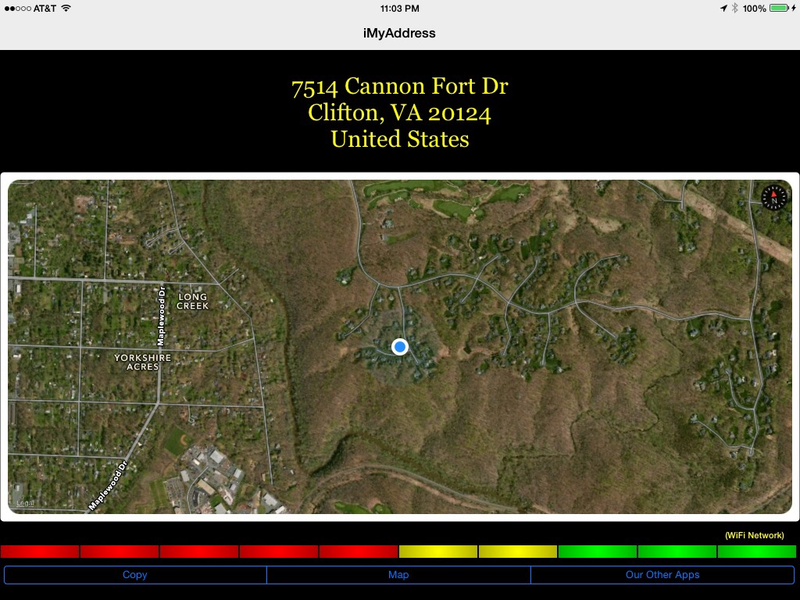 Current location is shown on a map with is zoomable and can be panned.